hello. would you care for a french breakfast muffin? Cinnamon and sugar atop baked goods just make me happy. The combination calls to mind the cider doughnuts we’d get at Echo Hill (as a child) or Atkins Farm (in college) after a day of apple picking in the fall. I love the sweet crunch of the sugar crystals, tempered by the warm spice of the cinnamon. There’s not a lot that goes better with a hot cup of coffee, I think (and, based on Viennese coffee and all the cinnamon shakers at your local coffeehouse, I think I’m not alone in that sentiment!) So, what could be better than a muffin that acts as a moist, fluffy vehicle for this classic flavor combination? I first heard of this recipe at a bridal shower – one of the women had attached one of her favorite recipes to a muffin tin to make the gift more personal. While this, in itself, was a brilliant idea, all I heard was ” … French … Puff.” I had no idea what the proper name of the recipe was; I only assumed it was some kind of muffin, given the pan; no one did any ooh-ing or aah-ing about it being a great recipe. But I was hooked – I had to find out what it was, and then I had to try it. Enter Google, and the discovery that the French Breakfast Muffin (also known as the French Breakfast Puff) was a very simple muffin, flavored only with a bit of nutmeg and then dipped in cinnamon sugar after it was baked. I made a batch. And then another. And, now, when I say I am making muffins, Husband always hopefully says “The good ones? ?” [aren’t they all good, dear??] and I know he means these. This recipe only makes 8 or 9 muffins. If there are more than three or four of you, you might consider doubling the recipe. I have, and it takes no special tricks. Preheat oven to 350F. In a small bowl, combine melted butter, egg and milk. In a medium-large bowl, combine all the dry ingredients. Add wet ingredients and stir until combined, but still a bit lumpy. Do not over-mix. Scoop batter into muffin tins that have sprayed with cooking spray. Bake for 20-25 muffins, or until they just start to turn a bit golden at the edges. Meanwhile, prepare the topping. Place the melted butter in a shallow bowl, and combine the sugar and cinnamon in another shallow bowl. 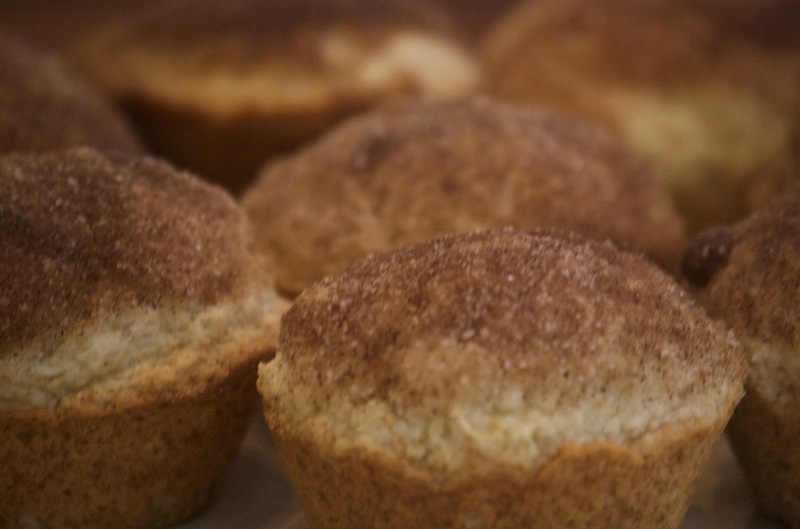 When the muffins are cool enough to handle, dip each muffin first in the melted butter, then in the cinnamon sugar. Gorgeous and delicious – I made these this morning and got great responses from adults and the under-4 set alike, although the under-4s did tend to eat the top halves of the muffins and ended up with a lot of cinnamon sugar on their faces. I doubled this and it worked easily – the only note I would make is that if you double the muffins, you don’t needed to double the topping as well. i just made these for easter morning….AMAZING! Thanks for sharing the recipe. The funny thing was that it was Kara’s shower where I first saw the recipe! Glad you made them and enjoyed them.